Halfmoon Bay is Area B in the Sunshine Coast Regional District, with a population of approximately 2600, spread out over 1275km. Interestingly, the Halfmoon Bay area includes Porpoise Bay from Tuwanek to the Skookumchuck, Salmon and Narrows inlets, Redrooffs (two ffs, if you please), Welcome Woods, Halfmoon Bay, Secret Cove and Wood Bay. Halfmoon Bay is a great location for young families, with many easily walkable streets laid out in an easy-to-follow naming and grid system. The Halfmoon Bay Elementary School operates on a slightly different schedule, with earlier start and 2:30 pm final bell, with half days on Fridays. The school dates back to 1915, and is officially designated a BC Community School: this includes on-site day care, preschool, after-school programs, teen nights and special classes. The school is known for a special focus on Fine Arts and has za very good Band program as well. Gardeners are another strong demographic in Halfmoon Bay. 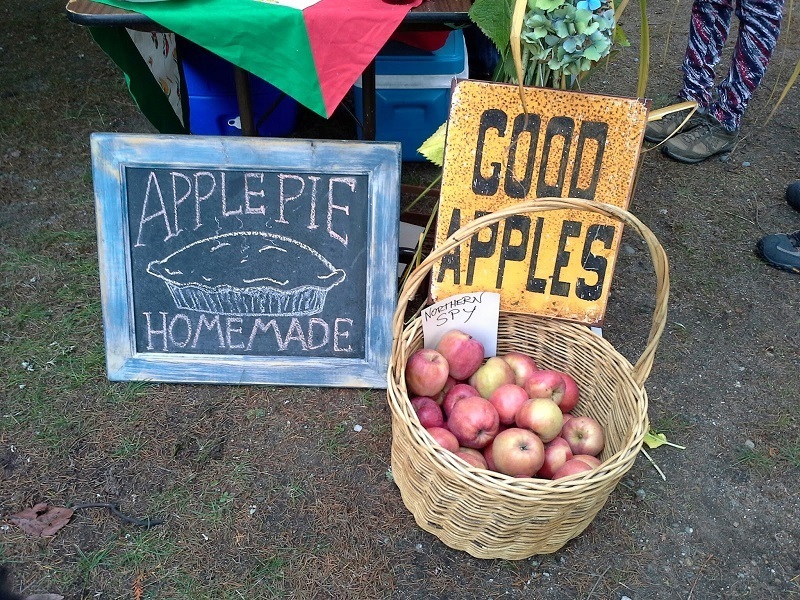 Larger lot sizes, plenty of sunshine, and good soil conditionoduce at roadside stands along Redrooffs Road. Halfmoon Bay is home to Sargeant Bay Provincial Park, which includes a marsh and beach with round stones and sand at low tides. This is a nesting area for herons, eagles and shorebirds, and home to a very busy pair of beavers within the marsh. On the high side of Redrooffs Road, the Triangle Lake trail system - a hikers only trail - takes hikers to Triangle Lake on a 1-1.5 hour round trip. The larger Halfmoon Bay trail system expands right across the area’s plateau, connecting Sargeant Bay with Trout Lake & Connor Park, and over to Coopers Green regional park on the edge of Halfmoon Bay proper. This is where some of the Sunshine Coast’s world-renowned mountain biking trails exist, and bears, fisher martins, mink and cougars make their homes. Just beside Connor Park’s trail system are two tournament sized baseball fields and a bike skills development area. Boating and kayaking/paddlesports are also popular in Halfmoon Bay, with a day launch ramp and vehicle/trailer parking offered at Coopers Green park. Kayakers depart from this park for the Merry Island lighthouse circle tour, cross to Frenchmen’s Cove, or head up Welcome Passage between the mainland and Thormanby Island on low-wind days. The Secret Cove area is home to marinas, resorts, boat rentals, Thormanby Island water taxi and sightseeing and fishing charters. Scuba diving is another popular sport in the region encompassed in Area B. Coopers Green is home to many certification dives around the small island just off the day launch area, and Sechelt and Narrows inlets see many dive excursions every year. 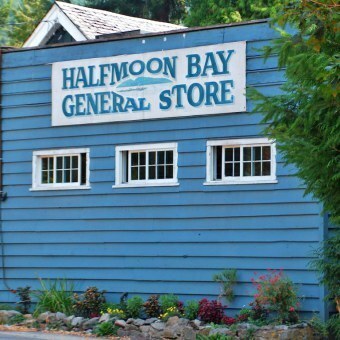 There are two general stores in Halfmoon Bay for groceries and convenience items: The Welcome Woods Market and Nursery, also referred to as ‘the Fawn Road market’, located in the residential neighbourhood on the plateau, and the Halfmoon Bay General Store, located just up the hill from the Halfmoon Bay Government Dock and 2 minutes off the Sunshine Coast Hwy’s second Halfmoon Bay exit. This store carries groceries and is a liquor store outlet; next door is the popular Halfmoon Bay Cafe with fresh baking, ice cream counter and gourmet pizza. In the Secret Cove/Ole’s Cove area about 10 minutes northwest of Halfmoon Bay there are three restaurants, including the seasonally open Upper Deck at Secret Cove offering unique west-coast dishes in the heart of one of the Coast’s busiest small harbours, and the Rockwater Resort Restaurant for cliffside fine dining overlooking the sand cliffs of Thormanby Island. We are proud to be the center for learning in our community. 190 k-7 students enjoy a well equipped school, a large field and playground with access to many trails for exploring and mountain biking. Every child has a safe and caring environment with opportunities for learning and fun. Our enthusiastic staff focus on building strong relationships and a love of learning! Parents and community members are always welcome to support our learners. We are a community school with on site daycare, preschool, StrongStart Center, a small garden, an outdoor classroom, after school programs, teen nights and special classes for everyone.